The way we live is changing fast. Every fortnight in our Future Focus series, supported by Volkswagen, we’ll look at how one aspect of everyday life could change in the coming years. This week: payments. “CAN I TAP?” This simple question has been at the centre of one of the biggest changes in the history of how we pay for everyday bits and pieces – and it’s just the tip of the iceberg of changes ahead. Contactless payment came to Ireland five years ago and it has become the default way to pay for transactions under €30. And with the contactless limit possibly rising to €50 next year, its popularity could soar even further. Even though it’s in vogue now, contactless took a while to take off in Ireland. After three years, it was only used for one in ten face-to-face transactions. But but that figure rapidly jumped to 45% last year, according to data from Visa. Elsewhere, contactless is even more popular. In Australia, it’s used for four out of every five transactions, while the Swedish have gone a step further. Only 2% of transactions in the Scandinavian country are made using cash, with card payments dominating. Visa Ireland country manager Philip Konopik says it’s not just millennials driving these trends at home and abroad, all age demographics are taking part. This is why the rate of technological advances in payments are expected to become widespread even quicker. “I think we are moving towards nearly a cashless society. Cash will always have some role to play. It’s important as a fallback as things do go wrong since no system can be ubiquitous. Sweden is predicted to be cashless within five years. I think Ireland will get there, not in five years, but I think within 10 years is realistic. You are already seeing some merchants moving to a card-only policy. That’s a tipping point, cash becomes so expensive for merchants to manage that they decide they don’t want to accept it. So the trends show cash is edging towards extinction, while the rate of change with contactless hints that people are open to new ways to pay. Dr Laura Bradley, banking expert and lecturer at Ulster University, says the likes of iris, fingerprint and facial scanning technology is about to change how we pay for everyday items even further. But will we be getting our eyeballs scanned to pay for a coffee, probably not. 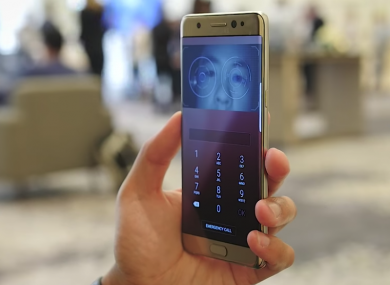 “We already have facial recognition and fingerprint identification on Apple and Samsung devices, and the technology is there to support using your mobile for payments. But I think the way biometrics will be used is to access the device, then through the device you access your credit card. So do I think they’ll use (eye contact) in retailers? Absolutely not. Sure people might get to a stage where they’re not looking to steal your wallet anymore, they’ll want to steal your eye. Konopik agrees that a lot of this tech will sit in the background and facilitate people to pay using their mobile, all while making smartphones as secure as possible. He adds that artificial intelligence – in tandem with biometrics – will also be used to make payments more secure and predict if your card has been stolen or bank account hacked. “Biometrics are increasingly becoming the way to authenticate. Within the next two years, it will become the primary way authenticate yourself at point of sale. It won’t exist in isolation, it will be combined with passwords, voice authentication, geolocation data – all this stuff. Artificial intelligence is also going to start telling us how we spend our money, according to Dr Bradley. So since cash is going by the wayside and payments through smartphones are becoming feasible, could credit and debit cards be phased out too? According to Konopik, we’ll be using our cards to spend money a lot less in the near future. “Your card is just a piece of plastic. It is a physical representation of a series of numbers. Those numbers can be digitalised in phones and devices. When you’re at home you might use Alexa to pay your utility bills or order some takeaway. You will do that by voice and your card will exist somewhere in the cloud. You don’t need a card for that. In another case you might be online and authenticate yourself through a message on your phone. The card will become more invisible. The credit card may survive a few years – even if it is in a digital format – but the businesses that really need to look over their shoulders are banks. Dr Bradley says if banks aren’t careful, tech giants like Amazon, Facebook and Snapchat could swoop in and steal their lunch. Email “Bye bye credit cards, hello paying by eyeball: The future of spending your money”. Feedback on “Bye bye credit cards, hello paying by eyeball: The future of spending your money”.